NASHVILLE, TN — As Nashville continues to grow in population, so does the diversity among the music communities of the city. This is especially the case for the city’s booming jazz scene. Singer/songwriter Dara Tucker is a multi-talented performer whose talents are adding to Nashville’s thriving jazz scene. Ms. Tucker can sing practically any style of music but she’s quickly establishing herself as one of the premiere voices in jazz, not only in Nashville but also on the national scene. From opening for Gregory Porter, to appearing on the Tavis Smiley Show, to winning the silver medal & the Ben Tucker Jazz Award in the prestigious, “American Traditions Competition” (2017), Tucker is making her mark in the world of jazz and beyond with a blend of soul, Americana, Gospel and jazz that is uniquely her own. ​In the past few years alone, she was named a finalist in the Mid-Atlantic Jazz Vocal Competition, and won the “Nashville Independent Music Award” for best jazz vocalist. She has performed at several of the top jazz festivals in the nation. Earlier this summer Dara released her 4th studio album, “Oklahoma Rain,” which showcases her as a formidable songwriter. 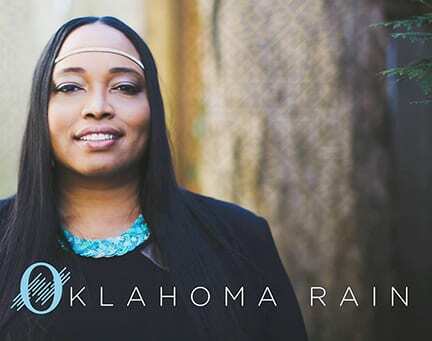 The project features original songs that pay homage to her hometown state and city of Tulsa, OK. The songs on the album focus on love, loss and healing. In 2014, Dara experienced a life-altering shift when both of her parents, passed away with very little warning. It is from that place of reflection and remembrance that Oklahoma Rain began to take shape. “This is an album about home, sort of that longing to be home, to be with family. At its core, this album is dedicated to growing up in my home state of Oklahoma but it’s also about the grieving process,” shares Dara from her Nashville area home. “The grieving process entails a lot of different things. I wrote one of the songs, ‘Radio,’ just a few months after I lost my dad in March of 2014. My mom died in September of the same year. So, there was only six months between those two devastating deaths. I wrote the song ‘The Game’ probably a year later,” she adds. The music world and Dara’s many new-found fans are happy that she added jazz and pop music to her repertoire. She now creates a mosaic of sound that reflects the influences that have helped to shape her since childhood.